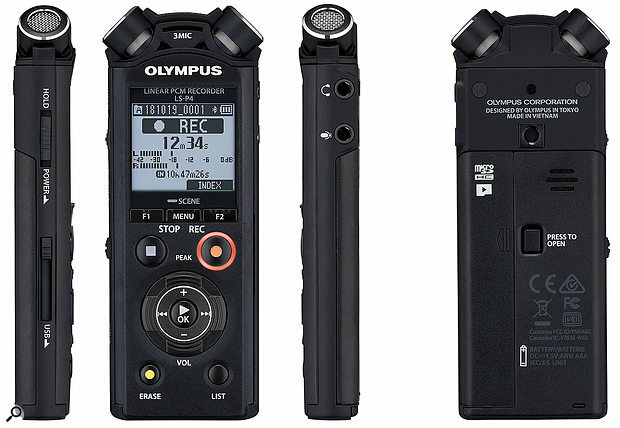 Olympus are one of the leading manufacturers of portable solid‑state recorders. Housed in a very compact metal body, weighing just 75g and no larger than a twin‑bar Kit Kat, their new LS‑P4 is built around their familiar ‘Tresmic’ three‑microphone array, in which the central omni mic is there specifically to extend the low‑end response. To help reduce the effect of environmental noise, the directionality of this mic array may be changed using the +/‑ buttons, from a wide pickup pattern to a narrow, more focussed pattern. The format is similar to the LS‑P2 we reviewed last year (http://sosm.ag/olympus‑lsp2) and this device again features the useful (but optional!) voice prompts when navigating the menus. Boasting a maximum SPL capability of 120dB, the LS‑P4 has a 20Hz to 20kHz frequency response (or 60Hz to 20kHz if the centre mic is off). It supports FLAC and MP3 formats, as well as PCM WAV, and recording and playback at up to 24‑bit, 96kHz resolution. Compared with PCM, the lossless FLAC format extends the available recording time from the 8GB of internal memory without sacrificing audio quality (a Micro SD card can be fitted to provide a greater MP3 capacity if you want the LS‑P4 to double as your music player). Recordings may be played back via a Bluetooth audio device or uploaded via the side‑out USB port — and you can check them using the internal speaker or headphones. The free Olympus Audio Controller BT app also permits remote control via Bluetooth. For serious recording, the record level can be set manually (by using the left/right cursor buttons while in Record Pause or during recording) and, as with other models in the range, there’s a safety limiter to take care of unexpected signal peaks. Metering is available on the LCD display, which is also used to navigating the menus. When using the recorder like a dictaphone, to take notes, the Auto mode comes in handy, as it adjusts the recording level according to the source. A two‑mic Noise Cancellation function is available: this is unlikely to be something you’d use when recording music but it could come in handy when capturing location sound effects or taking notes, where very close miking is appropriate. Essentially you speak, from close up, into one of the mics and the other one picks up ambient sound, which is then subtracted from the voice. On playback, there’s a variable speed option, and you can have the recordings normalised to make quieter recordings easier to hear. For those who approve of such things, there are also EQ presets for different musical genres! Other editing tools allow music to be faded in or out, files to be split or trimmed, unwanted sections to be erased, and so forth. The USB connector docks the recorder to a Mac or PC for file transfer, with the recorder appearing as an external drive, as we’ve come to expect. The included AAA rechargeable battery can be topped up via USB, but AAA alkaline batteries may also be used. Battery life in use is quoted as 31 hours. Also included in the package are a tripod stand and manual. Like the LS‑P2, the recording quality is very clean, with no significant noise and plenty of low‑end extension, courtesy of the Tresmic array. As a straightforward means of capturing location sounds or recording your gigs, it’s hard to beat — unless you need a more upmarket model with XLR inputs for external mics — and the price is very attractive too. And when off duty, it can double as a Bluetooth music player, which could be a handy way of auditioning your recordings on the car stereo!